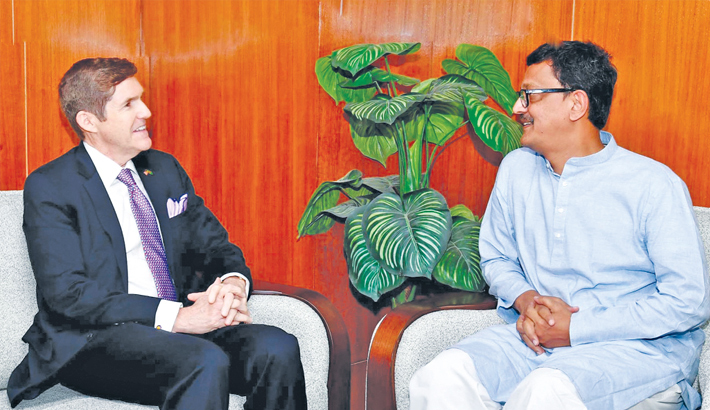 State Minister for Shipping Khalid Mahmud Chowdhury exchanges views with US Ambassador in Dhaka Earl R Miller at his ministry office in the capital on Wednesday. The United States (US) is willing to invest in the maritime sector of Bangladesh, US Ambassador in Dhaka Earl R Miller said on Wednesday. The US envoy came up with the willingness when he met with the State Minister for Shipping Khalid Mahmud Chowdhury at his ministry office in the city. During the meeting, they discussed the issues related bilateral interest, the activities and security of Chattogram seaport and the works of Mongla port, Payra port and Matarbari deep seaport, reports BSS.